PDF files are very common in our work life. However, it's not convenient to edit them at all, such as to add some texts to PDF files, change some contents, delete a picture from it or add a annotate into the text. Right? You may say YES! However, the answer is NO! Make best PDF editor for Mac as your assistant, and you can directly edit PDF files as easy as in a Word processor! And PDF editor Pro for Mac helps you not only convert all PDF files, but also edit all PDF files, including edit scanned PDF files. 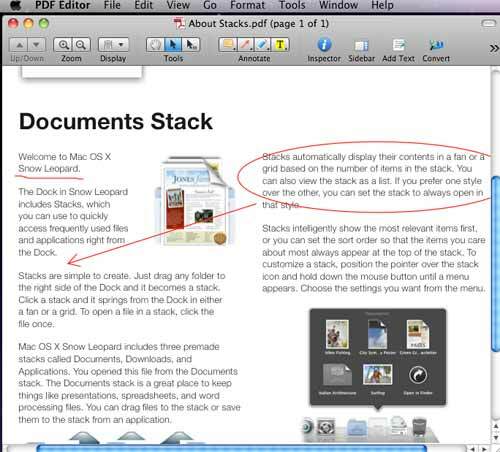 PDF Editor for Mac is a wonderful PDF editing program. It helps you edit text in original PDF files directly with in editable text blocks. With this PDF editing program, you can directly Add text, images, and signaturesinto PDF files;Markup, annotate PDF files easily while reading; Edit restricted PDF files in Microsoft Word by converting PDF to Word; Drag and drop blocks of PDF text and images to change the layout. As best Mac software, it is famous for high quality, user- friendly interface, fast speed.Then how to edit PDF files? How to insert some pictures that you need? How to edit bookmarks and properties? The tutorial will tell you step by step, just follow it. Step 1. Download and install PDF editor for Mac on your computer now. Click Customize icon to drag your favorite items into the toolbar, so that it will be convenient to edit your PDF files. Click File > Open form the toolbar, you can open the PDF files you need to edit. You can add ten PDF files at most. Step 2. Click Add Text icon, and then click any area of the PDF file to modify or insert text in editable text blocks. With PDF editor for Mac, you can drag and drop blocks of text to change the text layouts; allow you to change font-size, color, and font-family. If the system doesn't have the font of your selected text, there will be a pop-up window notifying you to auto-match font or select font when you want to edit the text. You can choose either and then modify the text. And if you always want to auto-match this kind of embedded fonts afterward for editing text, you can customize settings in the General window by choosing PDF Editor > Preferences… in the menu bar. Step 3. Insert and Crop Images. Mac PDF editor allows you to insert images, including graphics and digital signatures, into PDF files; Crop, resize, move, delete images in PDF files. Click Insert Image icon in the toolbar, and you can insert local images and graphics to the page.Select an existing image in the PDF file with Touchup Tool, and then click Crop Image icon in the toolbar, you can crop and resize the selected image or graphic. Step 4. Edit Bookmarks and Properties. Choose View > Sidebar > Bookmark in the menu bar to display bookmarks in the sidebar, and then you can add, remove, promote, and demote bookmarks for the PDF files. Click Inspector in the toolbar, and choose the tab Properties, then you can edit the properties of the PDF file, such as title, Author, Subject, and Keywords. Besides, as best PDF editing software, Mac PDF editor supports opening 10 PDF files simultaneously; It can be used to view PDF files as an intuitive PDF reader; Support searching in PDF files, and highlighting the results; Support emailing current document as attachment to others; Standalone, do not require additional software.